Those sterilized and killed by doctors in Nazi Germany have been the focus of a moving ceremony in the German parliament. Relatives of victims told harrowing stories of how their family members were put to death. The German parliament remembers the victims of the Holocaust every year on January 27, which is the anniversary of the liberation of the Auschwitz concentration camp. But for the first time, the commemorations emphasized the approximately 300,000 people who were murdered in Nazi euthanasia programs. The President of the Bundestag, Norbert Lammert, recalled that 2017 marked the 75th anniversary of the Wannsee Conference, the meeting held to organize and plan the mass murder of European Jews. Lammert said the conference reflected the "technocratic, cynical inhumanity" of Nazi Germany. But mass killings were already well underway before the 1942 conference. Doctors had been sterilizing people diagnosed as genetically ill since 1934, and systematic mass murder of such people had been taking place since 1939 as part of what became known as Action T-4. Those who didn't fit in with racist Nazi ideals of health were sent to six killing facilities in Germany and Austria. "Euthanasia began with the denunciation of people as useless mouths to feed," Lammert told the audience, which included German Chancellor Angela Merkel and German President Hans-Joachim Gauck. "Barbarism of language is barbarism of the spirit. Words became deeds." Lammert criticized the fact that most of the doctors involved in the killings had not been made to pay for their crimes against humanity and violation of the Hippocratic Oath, which he cited. He said he regretted that euthanasia victims had often been ignored in post-war Germany's attempts to come to terms with the Nazi past. And he added that every victim represented an individual human story. A Berlin actor with Down Syndrome read aloud a letter from Ernst Putski, an inmate in the Hadamar euthanasia center. In it, Putski described appalling conditions in the facility and wrote that as many as 30 inmates a week were starving to death. The letter was confiscated by authorities in the Third Reich and only recovered after the end of Nazi Germany. The philosopher Hartmut Traub recounted the life story of his uncle Benjamin Traub, who developed psychological problems after accidentally cutting off a finger and had to be institutionalized. He was deemed to have schizophrenia - a diagnosis tantamount to a death sentence in Hitler's Germany. "They were called ballast existence, life unworthy of life," Hartmut Traub told the Bundestag, before describing in gruesome detail the final day of his uncle's life. On March 13, 1941, Benjamin Traub was taken with some 60 others to Hadamar under the pretext of a day trip. There they were medically examined, herded into a showering room and gassed to death with carbon monoxide. The gold teeth of the victims were extracted, and the brains of those considered "scientifically interesting" removed for further study. The bodies were subsequently burned. This procedure prefigured the methods used to systematically murder millions of people in Auschwitz and the other death camps. "For six months, the dark clouds from the crematorium hung over the city, plainly visible for all to see," Hartmut Traub said. His uncle Benjamin was 27 years old when he was murdered. Relatives of euthanasia victims say that it is crucial to personalize the statistics about the number of people sterilized and killed. "The victims were not an anonymous mass," author Sigrid Falkenstein told the Bundestag. "They were individual people who laughed or cried." Falkenstein's aunt Anna Lehnkering was born with a learning disability. In 1934, she was diagnosed as "congenitally feebleminded," sterilized and committed to an institution. In 1940, she was sent to the Grafeneck euthanasia facility and gassed to death. "Her death sentence was a bureaucratic act," Falkenstein said. "She fulfilled the criteria perfectly." Falkenstein told the Bundestag that no one in her family ever spoke about Anna Lehnkering until she stumbled across her aunt's story by accident in 2003 and wrote a book about it. Falkenstein said that her father suffered from depression late in life - a condition she attributes to the repression of memories of his sister. Anna Lehnkering was 24 when she was murdered. Falkenstein called upon the German government to publish the names of all the euthanasia murder victims, something that has previously not been the case in Germany for reasons of privacy. Falkenstein said that should change. "It's important to tell stories like those of Ernst Putzki, Benjamin Traub and Anna Lehnkering," Falkenstein told Merkel and the others in attendance. "It's a way of making history tangible." Euthanasia victims' advocates were very pleased that the Bundestag had recognized the suffering of this group of people. "Family members were able to raise their voices, which for a long time were barely heard by the general public," Bernd Faulenbach, the chairman of the Association Against Forgetting and for Democracy, told Deutsche Welle. "The victims of medical murders used to be trapped in a 'shadow of memory,' as President Gauck so fittingly put it. It's only been recently that euthanasia victims have been given growing significance in the culture of remembering." 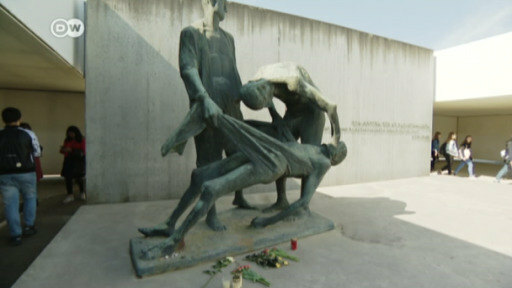 Hadamar, like the other euthanasia centers, are now museums and memorial sites. Hadamar director Jan Erik Schulte agreed that parliamentary recognition carried a lot of weight. "For the memorial sites and above all for relatives, it's a very important gesture that the Bundestag is remembering a group of victims who are still among the least known to the general public," Schulte said to DW. "It is a signal to keep the memory of the victims alive and to make it clear that this was a very large group of people. They belong in the canon of Germany's remembrance culture." And historians who research the euthanasia murders also welcomed the Bundestag ceremony. "For a long time, the euthanasia victims were the forgotten victims," Maike Rotzoll, Deputy Director of the Institute for the History and Ethics of Medicine in Halle, told DW. "That's why it's enormously important for us that this ceremony took place in the Bundestag. I think it's also enormously important for the relatives, who experienced the topic being taboo for so many years, to be allowed to speak and for this group of victims to be honored in this way."